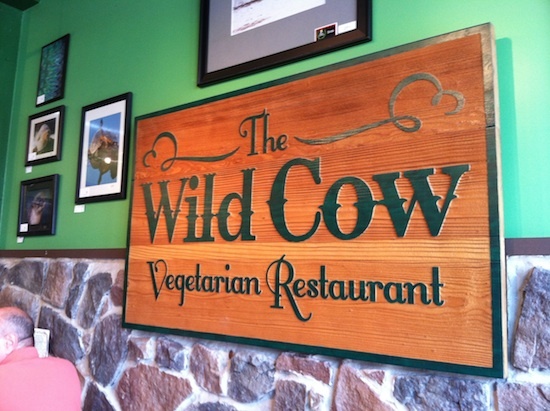 Once leaving Chattanooga behind (which also meant saying goodbye to Eric) I headed to Nashville to visit their one and only vegan-friendly restaurant, The Wild Cow. In many ways this restaurant is rad. 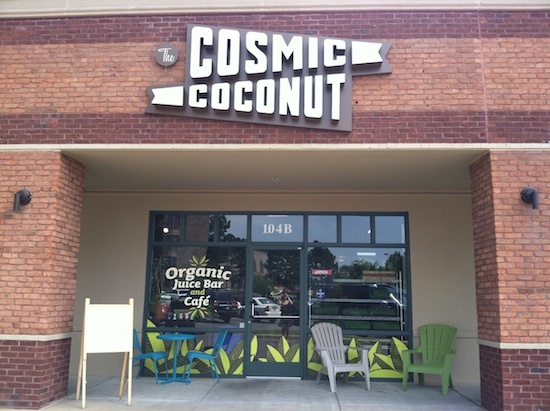 It’s got a cool relaxed vibe, good music, and the employees are as hip as they come. 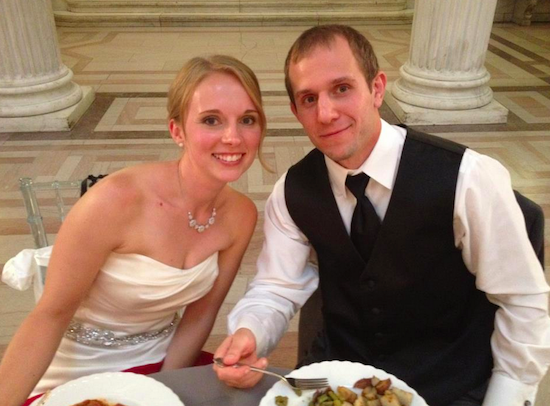 We also have another instance of bright green walls (= good food — 90% of the time). I also love that there are animal pics everywhere. Super cute! 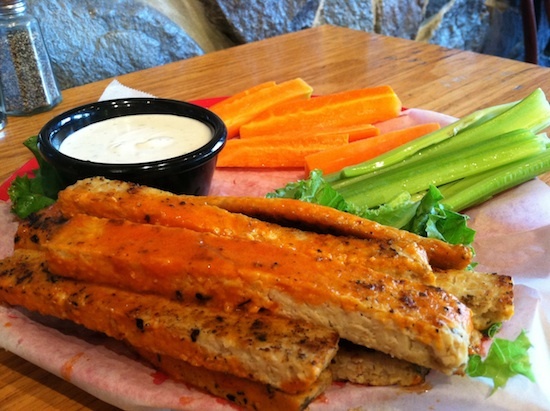 My first meal here was for dinner and I started with the Buffalo Tempeh Strips with vegan ranch dressing and veggies – organic grilled tempeh with buffalo sauce. In terms of flavor and smell (for both the strips and the ranch) this is the closest to what I remember the dairy- and meat-laden equivalents are like. I enjoyed this appetizer a lot. Definitely worth getting if you’re in a group (waaaay too much for one person, unless you intend to have it as the main meal — or want leftovers of course). 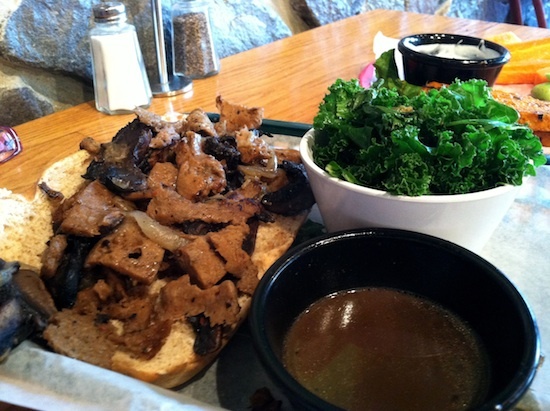 I then tried the French Quarter Dip – grilled mushrooms, seitan and onions with a Creole seasoning on a wheat hoagie, with a side of au jus dipping sauce and garlicy kale. Be sure to dip into or pour on the au ju sauce. It makes the sandwich at least twice as good. 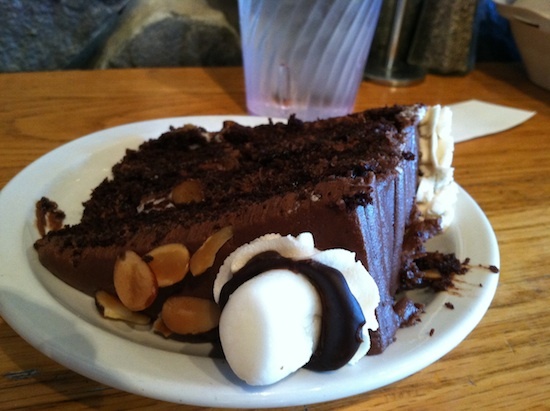 Finally, for the close of my first meal at The Wild Cow, I had a piece of the Rocky Road Cake – layers of chocolate mousse, cake, and marshmallows with thinly sliced pecans. 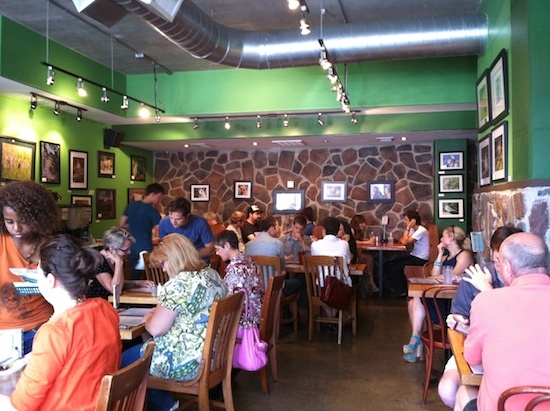 After I finished my meal I headed just a few doors down to Ugly Mugs Coffee & Tea to do some writing. I had since “checked in” to The Wild Cow via Facebook and while I was sitting there writing away I received a notification from a childhood friend saying that she was now living in Nashville. Oh how I love social media!!! Completely last minute she invited me to stay in her spare bedroom for the night. 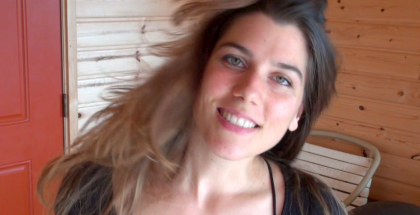 Um… a real bed, air conditioning, catching up with an old friend, AND a shower?! Heck yeah!! 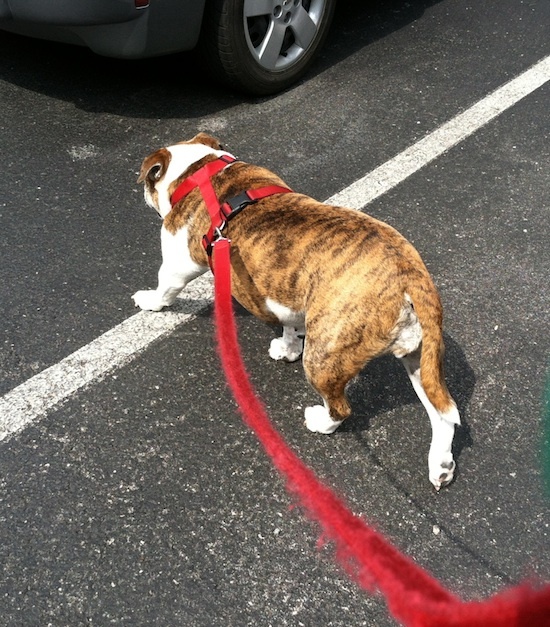 The next morning I took Roxy for a walk before heading back to The Wild Cow for lunch and then to Memphis for dinner. 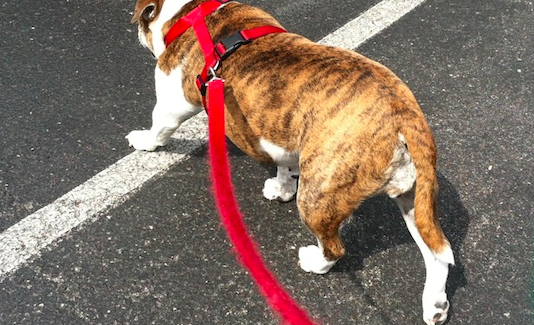 Walketty, walk, walk. 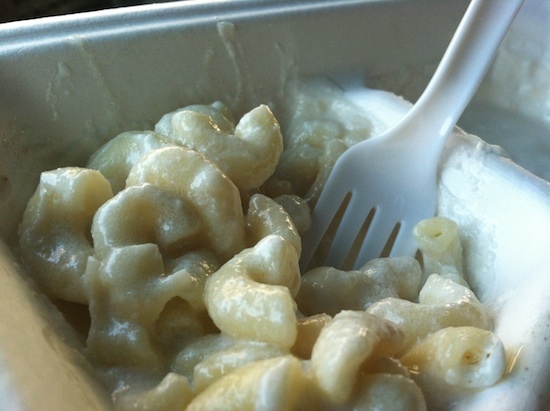 I went back to The Wild Cow for a quick lunch, and to grab something to-go for the road. 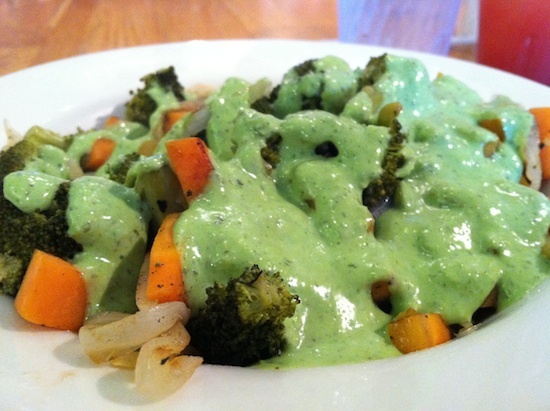 For lunch I had the Veggie Quinoa Bowl – grilled vegetables (carrots, broccoli, onion, and celery) over organic quinoa drizzled with green goddess dressing (you can also get garlic aioli, peanut, or ginger miso sauces). For my snack on the road (while driving to Memphis) I got a plate of Wild Cow’s Pinto Bean Nachos – tortilla chips topped with pinto and black beans, rice, vegan cheese sauce, homemade vegan sour cream, tomato, onions, and homemade salsa (you can add avocado, grilled seitan, peppers and onions). This dish made me think of an open-faced taco of sorts. The melty nacho cheese and green sauce were great!! I didn’t get a picture of the nachos though. Blergh. Three and a half hours later I was in Memphis, baby! 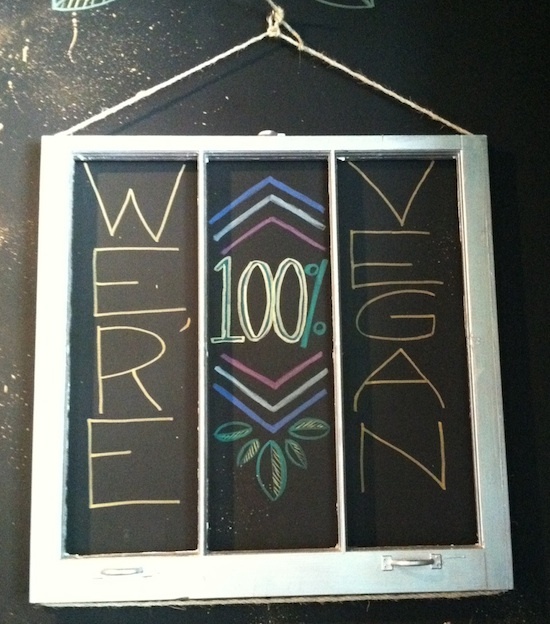 Welcome to one of the coolest vegan restaurants evs! This once-was-a-dive-bar restaurant has a huge menu filled with a wide variety of cuisine (pigs in a blanket, calamari, quesadillas, chicken nuggets, fried chicken, Philly cheesesteak, bacon melts, tacos, crab cakes, fried shrimp, drumsticks, turkey cutlets, eggplant parm, mahi mahi, spaghetti, borritos, breakfast meals… I mean, you name it and they’ve probably got it — or can make it). Inside it’s super casual with open floor seating, dim lighting, and a few holiday lights hanging about. It’s also very kid-friendly. They’ve got a ton of kiddo items listed on the menu, a kid’s play corner (be careful when walking to the bathroom, you might stumble over some toys! ), and there was always at least one little kid running around. It was actually pretty cute. 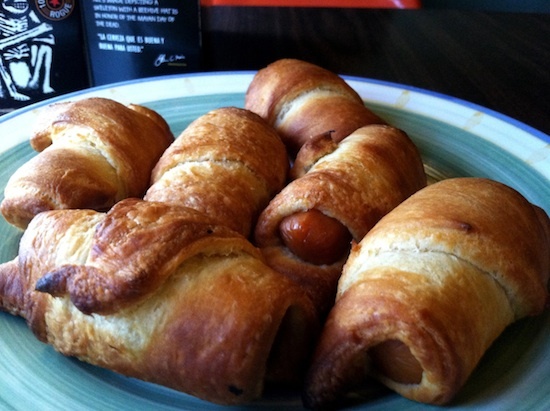 I’ve never had veganized “pigs in a blanket,” or Dogs in a Blanket (per the menu), so I decided to order up a batch of those. Oooh man there were so many!! The “dogs” were your standard veggie dog fare but what really made this appetizer stunning was the croissant-like crescent rolls, which were flaky, moist, and oh so buttery. Just delicious. I had only a couple bites of this surprisingly delicious treat before taking to Yelp! to figure out what to have for the main course. 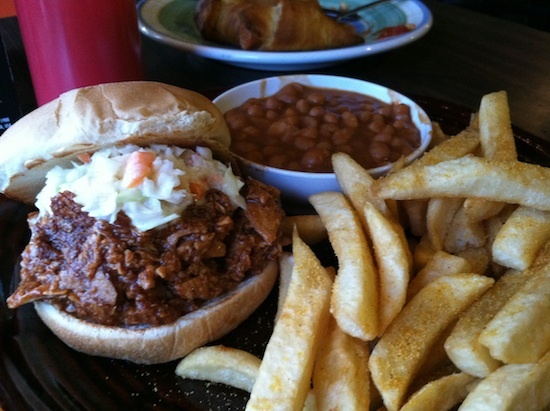 Based on an overwhelming number of recommendations for this one sandwich I went with the Vegan Memphis – shredded BBQ seitan topped with slaw, with a side of BBQ beans and fries. HOLY SMOKES!!!!!!! According to my notes I was rendered speechless after the first bite. The slaw is INCREDIBLE and the shredded seitan is PERFECTLY flavored. Not to mention the slightly sweet, pillowy bun. Oooh yeeeaaaah. 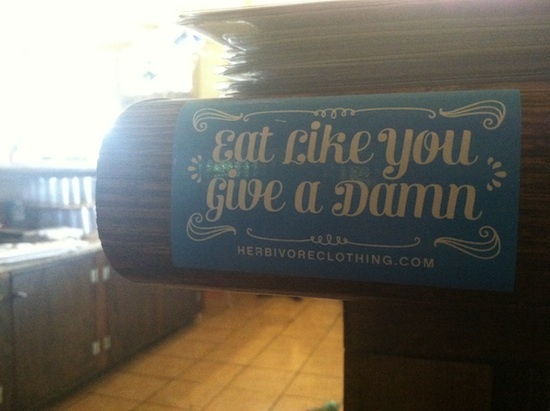 I rarely say this but, I don’t think an omni(vore) would be able to tell the difference here. I’m not all about trickery or anything but seriously. Wow. 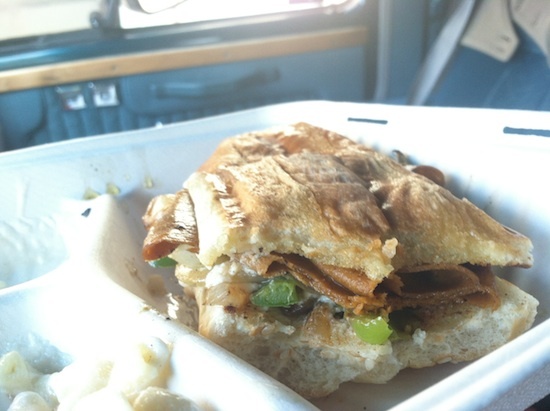 This sandwich TOTALLY and COMPLETELY rocked my world. 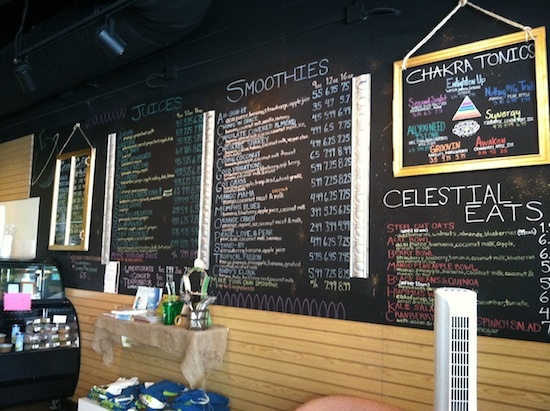 I really like this juice bar’s decor. It’s also super comfortable and calming. They’ve got a giant chalkboard and a corner that’s filled with awesome books. 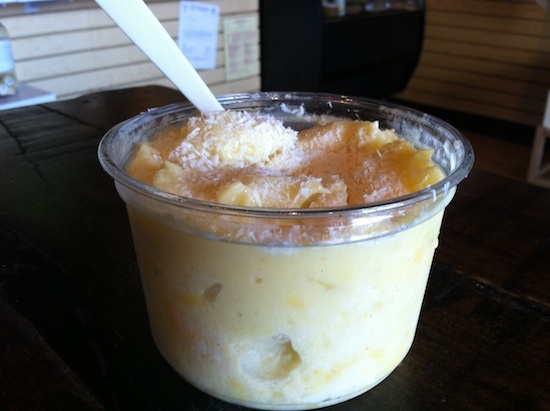 I had the Mango Pineapple Bowl – frozen mash of mango, pineapple, banana, and coconut milk with chunks of mango and coconut flakes on top. 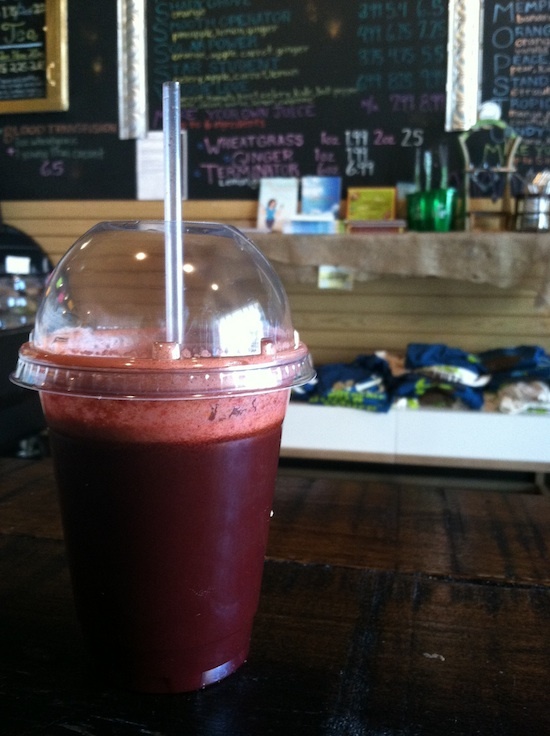 I also started the day with the Beetnick Juice – wheatgrass, carrot, ginger, beet, apple, and kale. 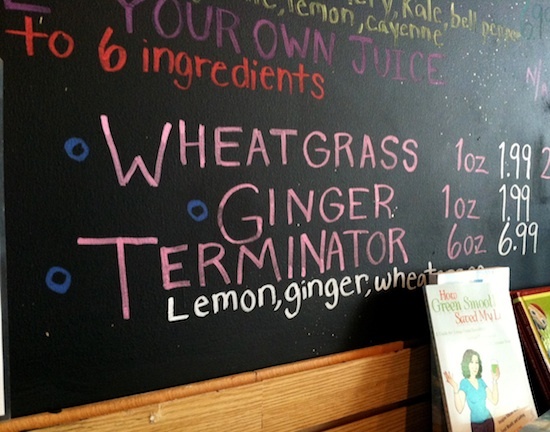 This was one of the best tasting, freshly pressed juices I’ve ever had. DELICIOUS! I also got the Chocolate Shaky to-go. That was scrumptious too!! I don’t have a history of listening to Elvis and I guess I wouldn’t call myself a fan in the traditional sense. But I do enjoy some of his music and there’s no arguing Elvis’ impact on music history. So that’s cool. Besides, when will I ever be in Memphis again? 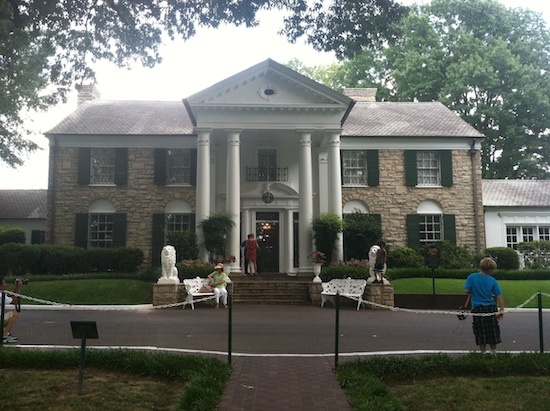 Graceland tour, it is! Yeah okay, I know. That was underwhelming. Haha! I had the whole headset, audio-guided tour thing going so I forgot to take more pics. 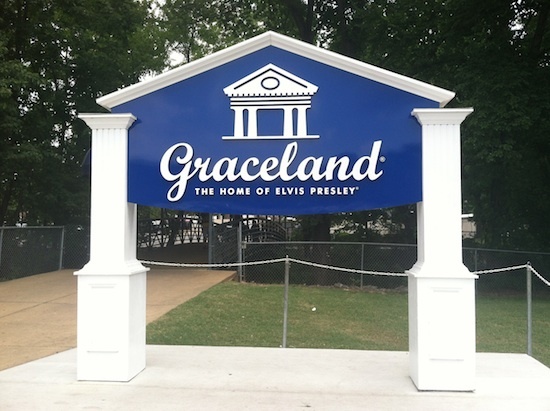 Regardless, whether you’re a huge Elvis lover or not, it’s worth touring Graceland. IMO. 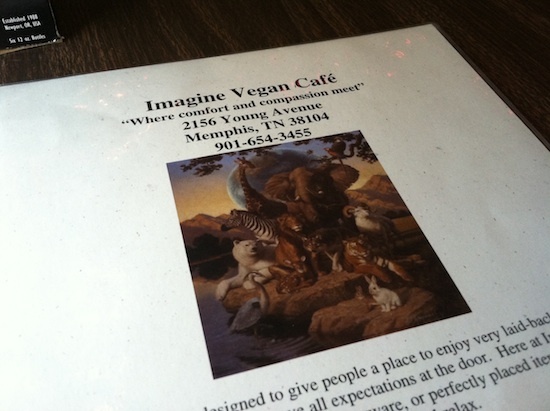 After spending half the day exploring Graceland I went back to Imagine Vegan Cafe to grab some dinner to-go for my six and half hour drive to Louisville, Kentucky. Premium Vegan Desserts serving Nashville, TN. Cakes for all occasions, from office parties to weddings, cupcakes of all sizes, raw cakes, cookies and cookies sandwiches, pies, tarts, brownies, and any custom work you need. 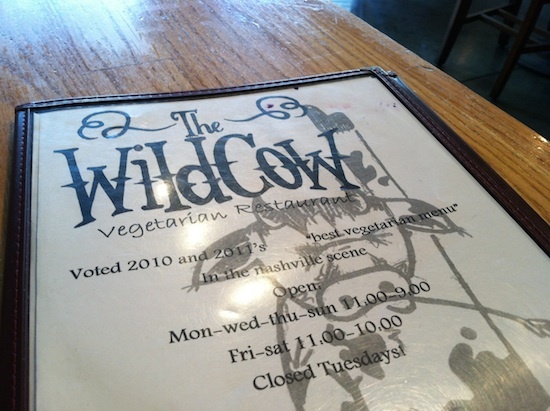 You can order from us directly, or place an order at The Wild Cow in Nashville. Khan’s are also for sale at Jamaicaway, and The BEhive in Nashville. Our desserts never have any refined sugar or bleached flour, animal products, artificial colors or flavors, or preservatives. 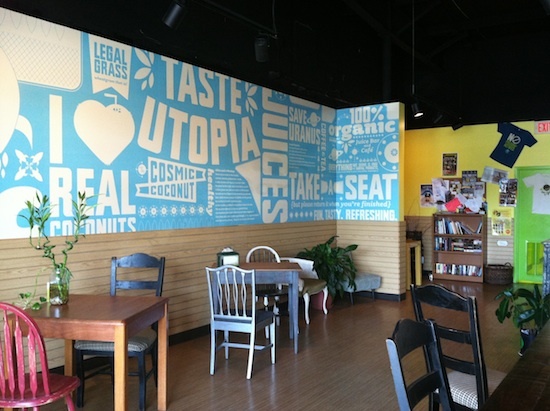 Good to know if you’re in need of vegan sweets, in the Nashville/Memphis areas! Yum yum yum! Wish I had known about this when I was in Nashville! Looks yummy! Good to know that there are delicious eats in Nashville. 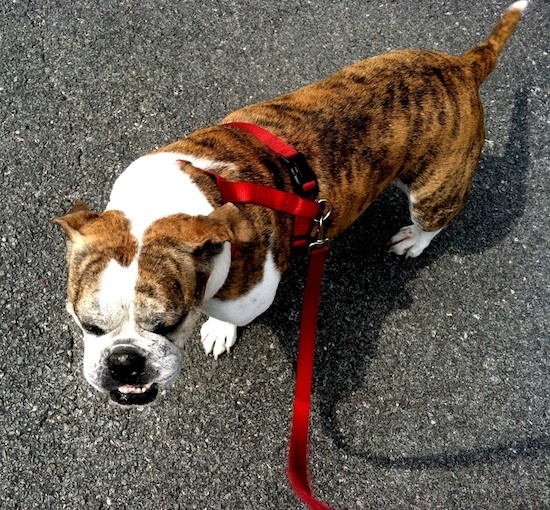 I love the pic of Roxy…same face I make in the morning before I have mah coffee. Have fun in Louisville!! Are you going to be in Lexington at all? That’s where I’m from…I don’t live there anymore though. So glad you got to experience Imagine. You are right about it being such a cool place. I’ve been going more or less once a week since they opened. I have a group of friends that most of us met just from going there all the time and they have become some of my closest friends so…bonus! You must come back and try the pizza, and the meatball sub, oh and the potato skins, the red beans and rice with sausage and..and…and…I could go on. I also must add you have not lived until you have one of Swell Baked Goods Peanut Butter Bomb cupcakes. 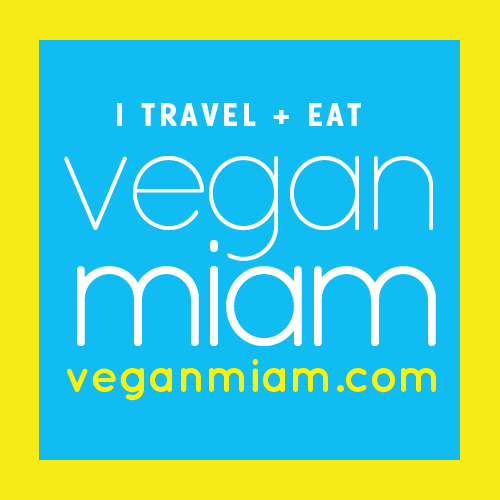 So please come back when you can stay longer and meet up with the Imagine Vegan Supper Club! Ooooh an Imagine Vegan Supper Club sounds amazing. And clearly I have a lot to catch up on as far as Imagine’s food goes. I’m so glad to hear that you and your friends are regulars. I worried that, given their location, the restaurant might struggle. Their food is so amazing, I do hope they can stay in it for the long haul. 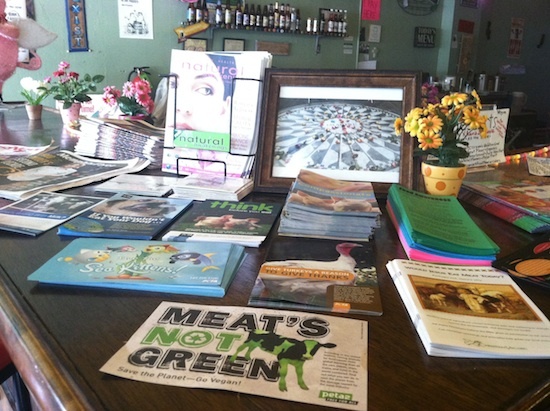 You missed the Sunflower Vegetarian Cafe in Nashville.